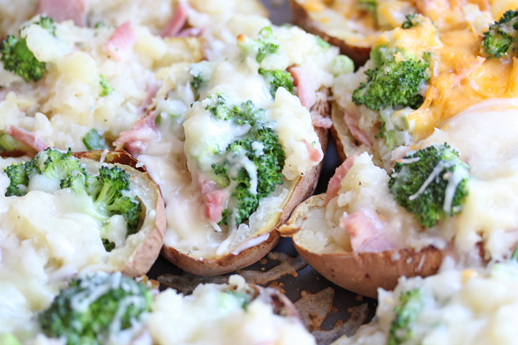 Tonight’s $5 Dinner Challenge…Twice baked potatoes…as a one-dish dinner. 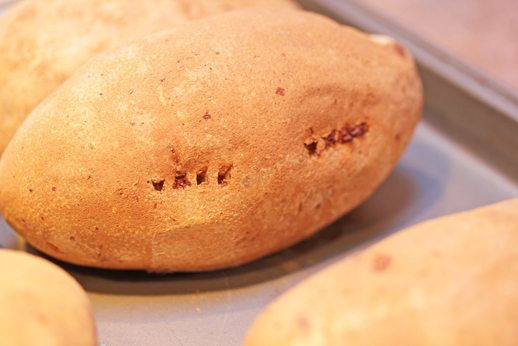 Plus, I’m sharing my twice baked potatoes piercing trick too! Duffy T, a long time friend of $5 Dinners, sent my a note about the way they do twice baked potatoes. They turn them into an entire meal by adding either chicken or ham and broccoli and cheese to the mixture. Mix in ham, broccoli florets and green onions. Spoon the mixture back into the shells. Serve Twice Baked One-Dish Potatoes, hot out of the oven with fresh fruit. I bet my house full of men will love those potatoes! Thanks for hosting Erin! Your site is in my top 5 most visited sites. Keep it up.